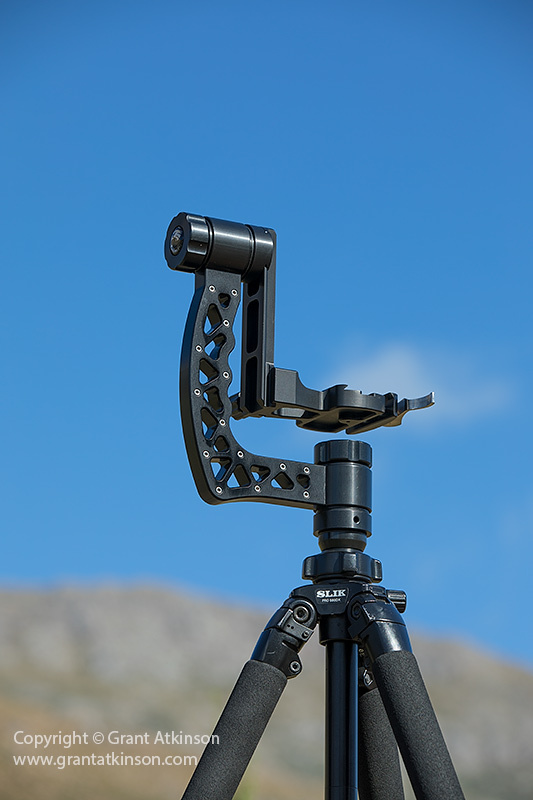 Gimpro have recently updated their gimbal head, and there are a host of improvements to be found in the new model, which is called the Mk 2. The Gimpro Mk 2 without a lens attached. Very importantly to me, the new Mark 2 gimbal head is made from the same high-quality construction, and using the same superior materials, as with the first version. The main structure of the gimbal is machined from high grade aluminium, and the components are assembled by hand and with care. Smoother edges on the pivot knobs are a feature of the Mk 2 gimbal. Attention to detail is high, and shows in the beautiful finish, with the black anodized chassis giving the mount a high-tech, classy look. This impression is reinforced when you handle the Gimpro, with the pivots not exhibiting even a millimetre of play or wobble. The black anodized finish is high-quality, and very resistant to scuffs and scratches. The Mk 2 gimbal is completely redesigned. It still runs on sealed roller-bearings, which allow for totally smooth panning and tilting. They are also unlikely to ever wear out with normal use, and they don’t require any maintenance or lubrication. 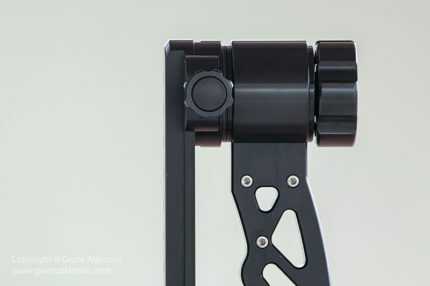 Most importantly, they enable the Gimpro to move very smoothly, and hold heavy weights without the action tightening up. The locking collars have been slimmed down and their edges rounded off a little on the new design. The L-bracket is also entirely new, with the lens foot attachment area becoming much wider and longer. The new L-plate on the Mk 2 gimbal is much improved over the older version. The bigger surface area makes the new gimbal much easier to use when attaching a big lens with a lens plate. The new mounting area is big enough that it supports the lens more safely whilst I am locking it into place and it also makes it easier to find the locking grooves. 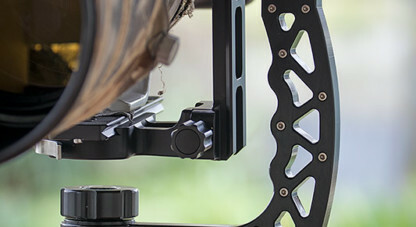 A vertical perspective of the new mounting plate showing its added width, making it easier to use. Also new on the Mk 2 gimbal is a locking lever, which works with a cam-action to snugly lock the lens foot into the mount. This is much faster and simpler to use than the old threaded knob found on the original Gimpro. One advantage of the older, threaded knob fastener system was that it fits any applicable lens plate, and the thread allowed one to account for small differences in the size of lens plates simply by tightening it turn by turn. 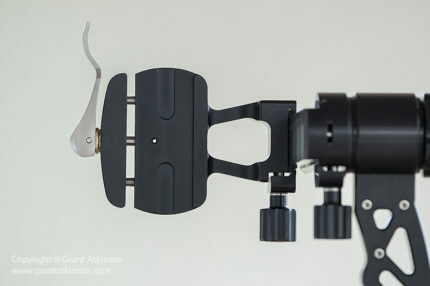 The Gimpro gimbal heads are made to work with the Arca-Swiss lens plate standard sizes. The cam-action lever allows for quick mounting and removal of lenses. 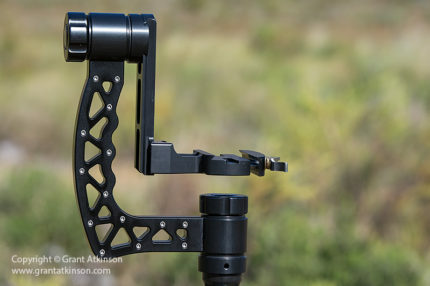 The cam-action lever is quicker to use though than the threaded knob on the old gimbal, simply push it firmly forward to lock the lens plate into place, and pull it backward to release. In order to account for lens plates which may show some variation in width, Gimpro has built in an adjustment collar to the cam-action lever mechanism. The knurled collar threads in or out, to make fine adjustments to the width of the lens plate mounting. It is designed to be turned by hand. A knurled collar can be rotated to make fine adjustments to ensure a snug fit for different size lens plates. 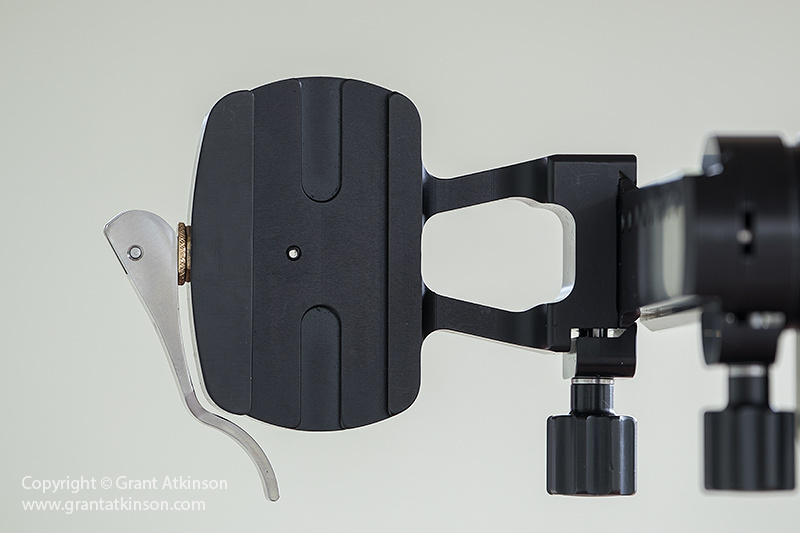 It is effective for making adjustments to the cam-action lever, so that it should accommodate any Arca-Swiss lens plate, but if you have a lot of lens plates from different manufacturers and they differ by more than a few millimetres, it can be a bit fiddly if you have to adjust it often. I use multiple lenses on my Gimpro all with their own lens plates permanently attached, so I am in the process of making sure all my lens plates are the same size, just to save me some time when I work with several of them in succession. Using the Gimpro Mk 2. There are many reasons to like using a gimbal head, most of them related to shooting with lenses that are big, or heavy, or need to be kept steady for long periods. The gimbal relieves me of having to hand hold whichever lens I am shooting with. This becomes more important when the lenses are big and heavy. The extra stability and steadiness that comes from shooting off a solid mount becomes more critical whenever I am using very long focal lengths, like from 400mm upward. 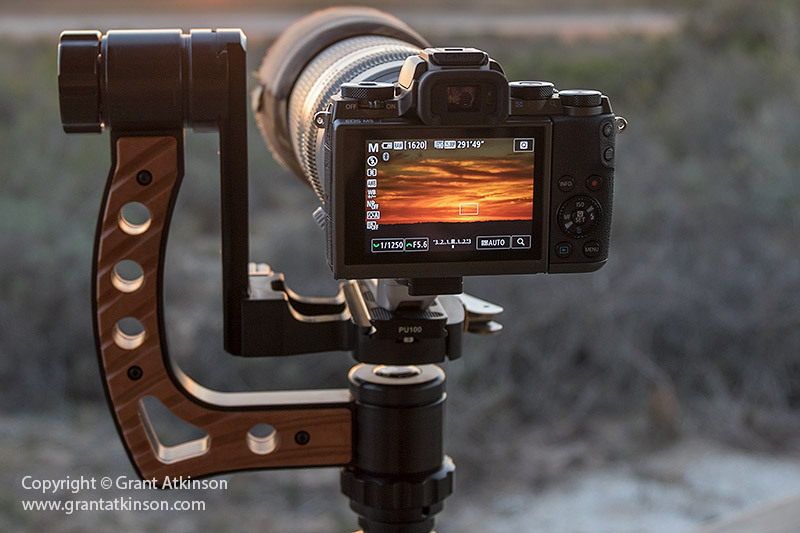 If I am shooting in low light, and shutter speeds may be longer, then it becomes imperative to have the lens supported on a tripod, and I prefer gimbal heads to other options for working with the telephoto lenses that I do most of my work with. 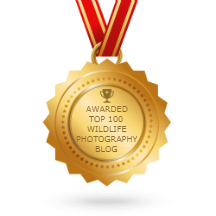 I use my gimbal head when I am using my EF 500L f4 IS lens for taking wildlife images and also when using a medium-sized telephoto lens like the EF 70-200L f2.8 IS for product photography. 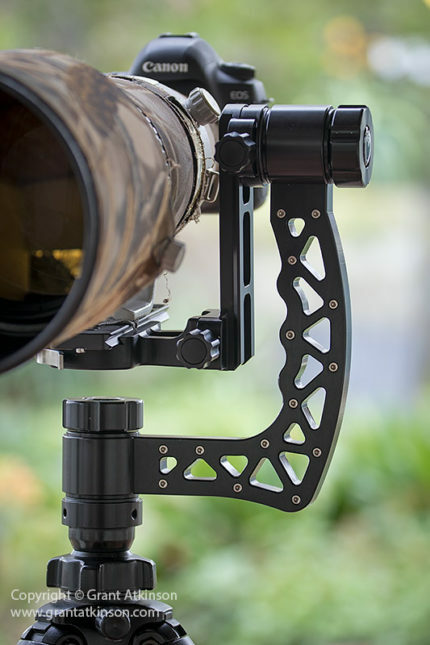 Gimbal heads support the lens by means of an L-shaped bracket that hangs below the main pivot. If the lens is carefully positioned in the gimbal, with regard to weight distribution, then the lens and camera combination can be perfectly balanced. 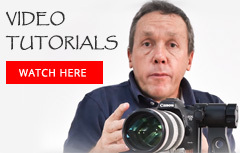 Set up in that way, controlling the camera and making up, down or sideways movements becomes effortless. 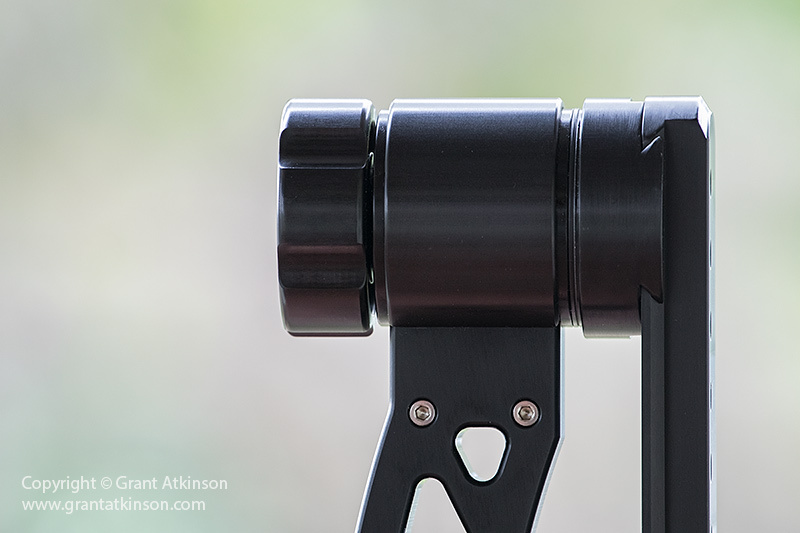 Using big and heavy telephoto lenses is safe and easy when mounted on the Gimpro Mk 2 gimbal head. 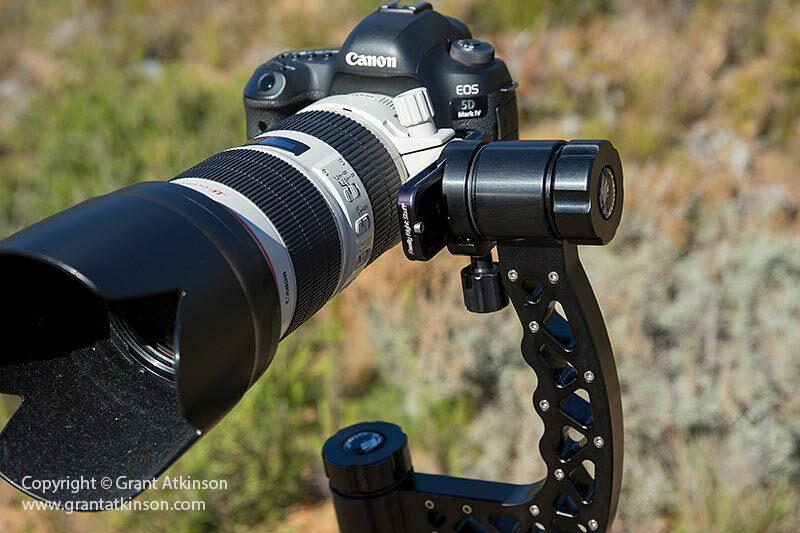 Helena Atkinson demonstrates with the Canon EF 500L f4 IS ii and 1DX. In many ways, modern camera gear is developing in such a way that it makes more and more sense to shoot using some form of support. Camera sensor resolutions continue to climb. 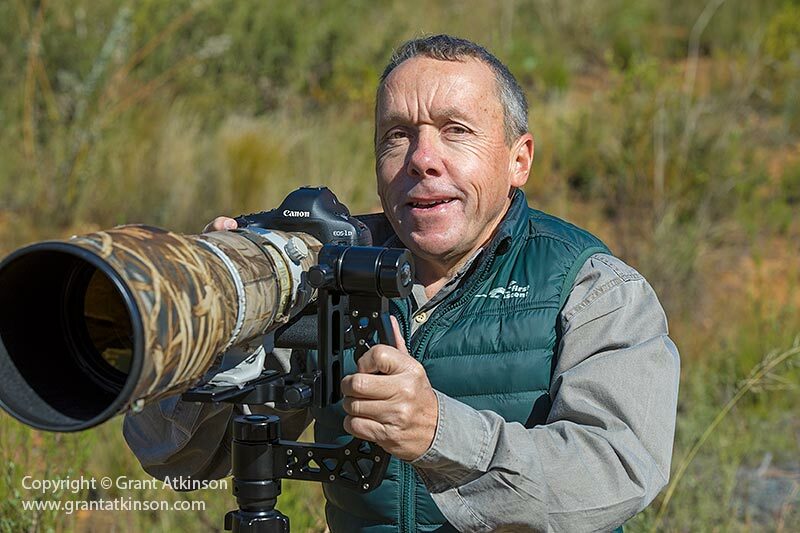 The Canon 5DSR at 50 megapixels and the Nikon D850 at 45 megapixels are but two of the high-resolution full-frame camera bodies on the market that come to mind. This is equally true for ‘crop-sensor’ cameras like the Canon 7Dmk2 and the Nikon D500 which also have fine resolution and similar pixel-pitch sensors. Having good support like a high-quality gimbal head can allow all these cameras to fully deliver their maximum image quality, without suffering the degrading effects of camera shake. There have never been as many big telephoto lenses on the market as there are now and more people than ever are benefitting from the long focal lengths, specially when it comes to wildlife photography. Sigma and Tamron have 600mm lenses on the market, as do Canon and Nikon, in addition to their 800mm offerings. 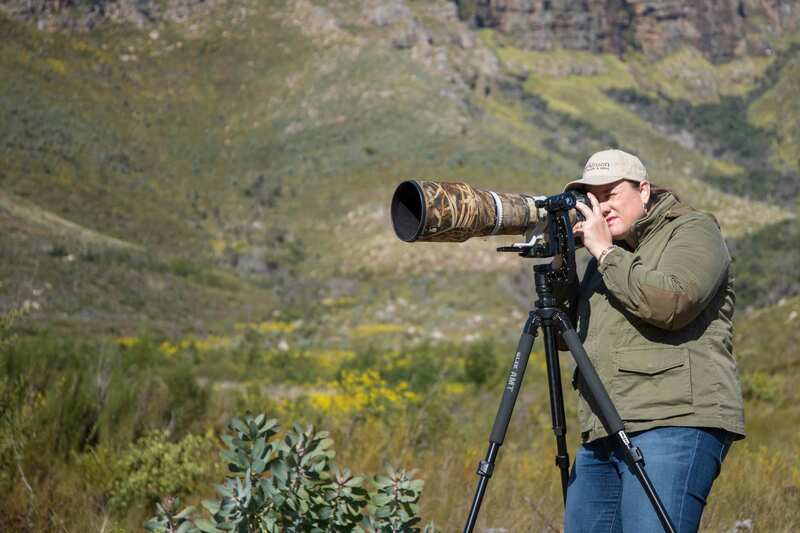 There are also a growing number of extender/teleconverter setups that function with 100-400mm zoom or 80-400mm zoom lenses. All this means that more photographers than ever are using ultra-long focal lengths. Just like with the high-resolution sensors, that extra focal length can be utilized to its full potential more easily when the camera and lens is properly supported and high-quality gimbal heads do this perfectly. Mirrorless camera bodies that are attached to telephoto lenses can become quite difficult to handhold, due to their small size and lack of space or grip surface. In such instances, mounting them on a gimbal head makes for a much more comfortable user experience. 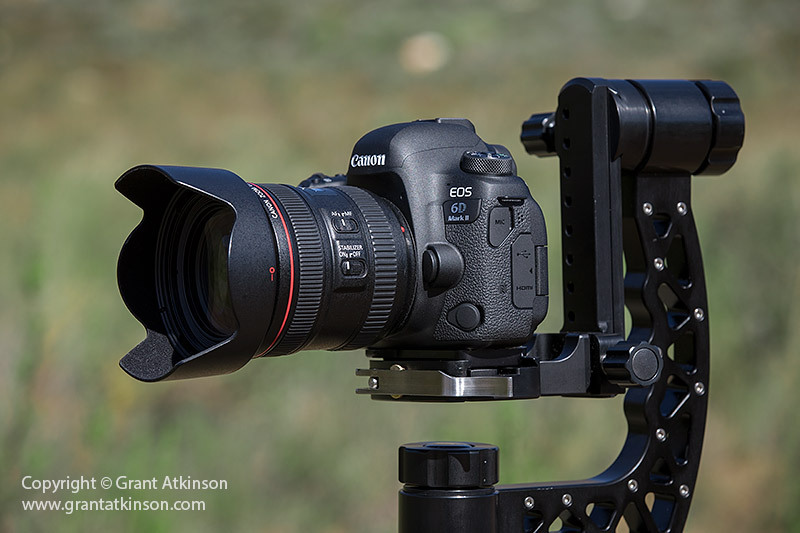 Despite its much larger L – bracket and bigger working surface, the Mk 2 gimbal is only a little bit heavier than the original Gimpro. Given that the new gimbal is both quicker (and safer for lenses)to work on, the slight weight gain is justified. What is also very reassuring for me is that this new Mk 2 Gimbal is built just as tough as the original Gimpro gimbal. I have been using my original Gimpro for almost 5 years now, and in that time it has been subjected to the usual sun, dust and a little rain, that any African outdoor photographers equipment might be exposed to. But, my own Gimpro has also ended up (by accident) on the rough floor or a game viewing vehicle where it was trodden on and shaken about for a couple of days before I found it. That happened more than once. It is not that I don’t try to take good care of my equipment but working as a photographic guide sometimes means my own stuff is not always a priority and it is nice to know that the Gimpro can shrug it off. Despite the rough treatment that it has received, my original Gimpro still looks pretty good, almost like the day I got it. Just as importantly, it still works perfectly, all the bearings rotating smoothly, all the threads still perfect and the locking collars slick in their function. All of which gives me a high degree of confidence in the build quality of the Gimpro, both original and the Mk 2. Due to its aluminium construction, it is possible to induce some vibration in the Gimpro gimbal head, which is most likely to be noticed if the tripod it is mounted on is standing on a very hard surface like concrete. If I am product shooting indoors I just wait a moment longer to trip the shutter or I just keep my hand on the top of the lens for a couple seconds which stops them right away. The vibrations are a non-issue for me when I am shooting with the tripod outdoors. If you wish to remove the hanging L-bracket you can also mount a lens plate directly to the top pivot of the Gimpro. The Gimpro in a side-mount configuration mode with a Canon 5Dmk4 and EF 70-200L f2.8 IS. 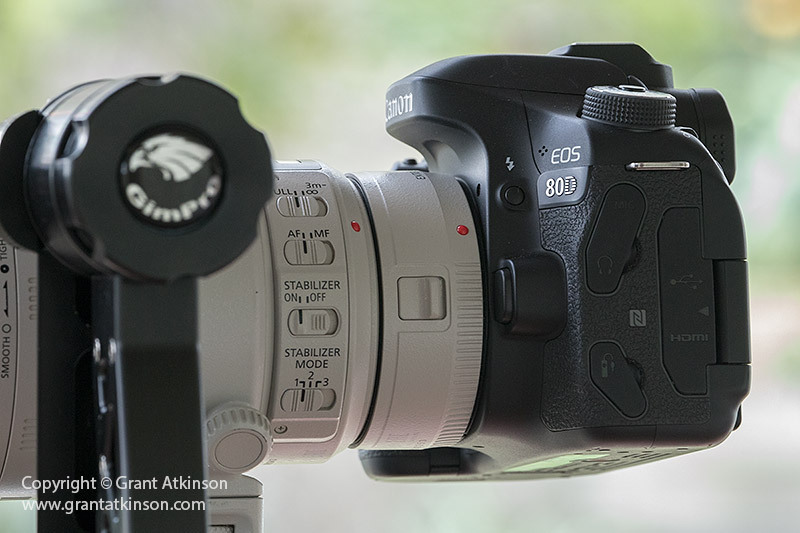 This can make for a lighter combination overall and works well when using shorter focal length lenses although the Gimpro can mount the biggest lenses this way too. If you do work in this way, you lose the free-floating, balanced weight distribution that comes with using the hanging L-bracket. The centre of gravity of the whole rig is raised upward, which reduces stability, so extra care needs to be taken with the tripod. It is also possible to reconfigure the Mk 2 gimbal head for use with a camera fitted with a wide-angle lens. Usually wide-angle lenses do not have tripod collars on them nor do they have the space for collars. Instead an attachment plate is mounted directly to the bottom of the camera. Wide-angle lenses are usually not so heavy nor so long that they put pressure on the mounts when used in this way. Although this way of using the Gimpro Mk 2 is not necessarily the most elegant way of stabilizing a wide-angle camera and lens, it is effective and very stable. The Gimpro in use with a Canon 6Dmk2 and wide angle lens. Live View and a flip-out screen are useful for working this way. 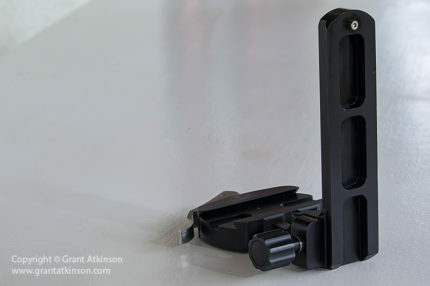 It is also possible to take off the bottom mount, and flip it over, which will allow the camera to be mounted on the top of the pivot, making it easier to reach the viewfinder if you are not using Live View. 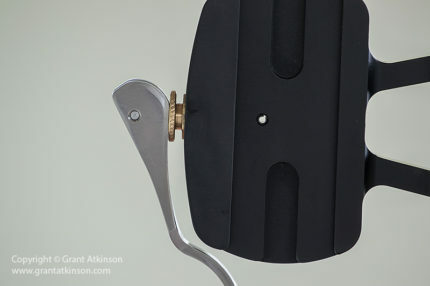 Large mounting surface for the lens foot. Designed to work with a growing number of Gimpro devices.